The Pentax K-x is a new mid-range digital SLR that combines the compact body and simple operation of the entry-level K-m camera with some of the advanced features of the prosumer K-7 model. 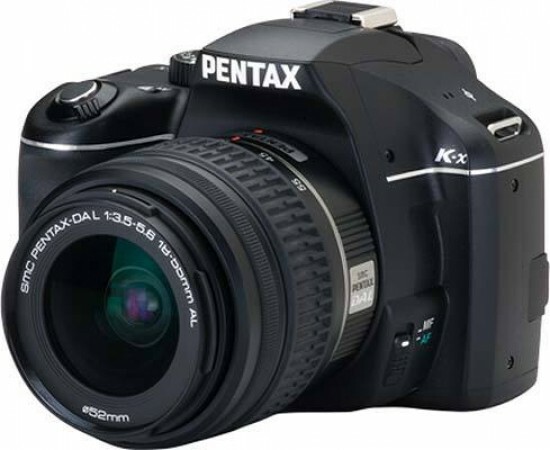 The 12.4 megapixel Pentax Kx offers an uncluttered design that is particularly well-suited to compact camera owners looking to make the step-up to a DSLR whilst featuring the same 11-point wide-frame AF system with 9 cross sensors and 2 line sensors as the K-7. In addition to Live View, the Pentax K-x also joins the growing list of DSLR cameras that can record video, with a best quality setting of 1280x720 pixels at 30fps. Other key features include a 2.7 inch LCD monitor, built-in Shake Reduction system to help avoid blurry photos, Dust Removal system to prevent dust from appearing, 4.7fps continuous shooting, and a full range of automatic and manual shooting modes. Auto sensitivity control up to ISO 12800, dynamic-range expansion, in-camera High Dynamic Range and built-in digital filters complete the headline specifications of the AA-battery powered Pentax K-x. The Pentax K-x will be available in black, white, red and blue in October for £599.99 / $599.95 with the 18-55mm DAL kit lens (also available in all four colours), and £749.99 / $849.95 with the 18-55mm DAL and 55-300mm DAL double kit lens. An additional kit with the smc PENTAX DA L 18-55mm lens and smc PENTAX DA L 50-200mm zoom lenses is available in the US for $749.95. 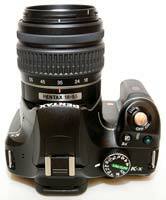 The Pentax K-x is outwardly very similar to its cheaper brother, the K-m, with just a few minor changes. When you pick the K-x up for the first time and attach the supplied 18-55mm kit lens, this little DSLR actually feels quite impressive, despite its budget price-tag and all-plastic construction. Very little about the K-x build quality feels compromised - it even has a sturdy memory card door (typically a weak-point of entry-level DSLRs) and metal tripod mount in-line with the lens. Images are saved to SD / SDHC cards, the most common media format currently available, with a slot accessed via the right hand side of the DSLR, if viewed from the back. The four AA batteries which power the camera are stored in a separate compartment at the base of the handgrip. The K-x is just a little smaller than the Nikon D3000 and the Olympus E-450, definitely fitting into the small and light DSLR category. As you'd perhaps expect at this price-point, and unlike the more expensive K-7, the Pentax K-x doesn't offer any form of weather-proofing. The camera has a deep, contoured handgrip on the right-hand side, coated in a rubberized compound to aid grip, that enabled me to use three fingers to hold it and my right forefinger to operate the shutter button. There is a generous contoured area where your right thumb sits, with the rest of the body finished in a textured matt black plastic. The K-x also retains the rather strange, thin silver rim around part of the body that in my opinion makes it look cheap rather than stylish (which is presumably what the designers intended). Just like Pentax's other DSLRs, the shutter release action on the Pentax K-x is quite loud and mechanical, something that you will either love or hate. I liked it, although it isn't great for close-up candid photography as your subject will probably hear you if you get too close. The Pentax K-x is certainly lightweight enough for you to carry around over your shoulder all day, even with the four AA batteries that power it inserted. Using a set of high-powered rechargeable Ni-MH batteries, the Pentax K-x was still going strong after over 2 weeks of intermittent use and 500 test shots - Pentax themselves claim a battery-life of between 1,100 and 1,900 shots, incredible for any DSLR, never mind such an affordable one. This makes the K-x a great choice for long trips away in far-flung climes, as back-up supplies can be easily found and replaced almost anywhere in the world. The K-x inherits the 11-point AF system of the Pentax K-7, which is a big improvement on the K-m's slower and less accurate 5-point system. Focusing is quick and consistent in good light with the standard 18-55mm kit lens, even with fast-moving subjects that travelled across the frame, which is a marked improvement on previous Pentax DSLRs. The 11-point AF system offers fairly generous scene coverage and the camera also happily achieves focus indoors and in low-light situations. Unlike the K-7, the powerful AF Assist lamp can only be used if the built-in flash is raised. The K-x is also quick to get going. Flick the on/off switch that handily encircles the main shutter button and you're up and shooting in around a second, and with no noticeable shutter delay. The K-x features a newly designed shutter unit which provides a fast top shutter speed of 1/6000th second and a very competitive 100,000 shutter release life-span, a figure more commonly associated with professional SLR cameras. 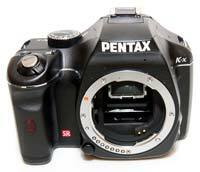 The K-x features the same high-speed PRIME (PENTAX Real Image Engine) II imaging engine as the K-7. It takes less than a second to store a single JPEG image at the highest quality setting with no discernible lockup between taking shots, allowing you to keep shooting as they are being recorded onto the memory card. 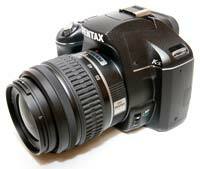 For single RAW images the Pentax K-x is just as fast, again with no lockup between shots. In the fastest continuous shooting mode you can hold down the shutter button and take a very speedy 4.7 frames per second for up to 17 JPEGS or 5 RAW files, or there's a slower 2fps mode available which allows you to shoot JPEGs until the memory card becomes full or 11 RAW files. This makes the K-x the quickest DSLR camera in its class in terms of continuous shooting speed. The tried and trusted dust removal system works in three stages: first, an anti-static coating on the CCD helps repel dust and other nasties, while secondly, any that do settle are shaken free by a high speed, vibrating CCD-shift mechanism. Lastly, a sticky pad at the base of the CCD collects any stray particles to prevent them from attacking the sensor a second time round. If you've had a bad experience with DSLRs and dust in the past, then the K-x offers a neat feature called Dust Alert which is designed to show exactly where the dust is on the image sensor. A vertically and laterally correct image of the sensor shot at f/16 is shown on the LCD screen, indicating exactly where any stubborn dust particles may be lurking. While this feature won't prevent dust from getting onto the sensor, it does provide a quick and easy way of checking for it. In addition Dust Removal can be set to activate whenever the camera is turned on, and you can also use the built-in Sensor Cleaning function to lift the mirror and clean the image sensor with a blower brush or third-party cleaning solution. Dust removal is twinned with a shake reduction feature, meaning that any attached Pentax KAF-mount lens immediately becomes stabilized. This works with almost any lens that you attach to the K-7, providing a significant cost advantage over DSLRs from Canon and Nikon, which use a lens-based image stabilisation system (compatible lenses are the PENTAX K-, KA-, KAF-, KAF2- and KAF3-mount lenses; screw-mounted lenses (with an adapter); and 645- and 67-system lenses (with an adapter)). Turn it on in the main menu and the K-x automatically compensates for camera shake, which is a slight blurring of the image that typically occurs at slow shutter speeds. In practice I found that it does make a noticeable difference, as shown in the examples on the Image Quality page. You don't notice that the camera is actually doing anything different when Shake Reduction is turned on, just that you can use slower shutter speeds than normal and still take sharp photos. When you turn the K-7 on or change the shooting mode, a graphical overview of how that mode operates is briefly displayed on the rear LCD screen. The 2.7 inch LCD screen is identical to the K-m's - it's bright, clear and has a perfectly acceptable refresh rate, although the pixel count of 230K dots is no more than merely adequate by today's standards. The rear screen also doubles as a comprehensive status display, which can be called up by pressing the OK button in record mode. If you then press the INFO button, you can also change all the settings right on the screen using a combination of the navigation pad and the rear e-dial. This ingenious solution spares you the pain of having to enter the menu, and makes most setting changes very simple. The colour temperature of the screen can be modified if you think it doesn't match that of your calibrated computer monitor, but the contrast and gamma cannot be altered. The large shooting mode dial on top of the Pentax K-x offers dedicated modes for moving subjects, close ups and night portraits, flash off, macro, landscape and portraits – alongside the more creative likes of program, aperture priority, shutter priority, and manual. These are backed up by full auto (the Auto Pict mode) and 10 different scene mode settings. The latter includes a night scene setting, a surf and snow setting, a text mode, food, sunset, kids, pet, candlelight and 'flash prohibited' museum modes. All are indicated via the rear screen by unthreatening cartoon icons. The Auto Pict mode automatically detects scenes that require the Night Scene Portrait, Portrait, Landscape and Macro modes. The camera automatically sets the aperture, shutter speed, white balance, saturation, contrast and sharpness, leaving you to get on with composing the scene and taking the picture. Pentax have also included the Sv mode from the K-m on the K-x. Sensitivity-Priority automatically selects the best combination of aperture and shutter speed for your chosen ISO speed. The sensitivity can be shifted instantly (in 1/2 or 1/3 steps) by turning the rear control dial. This allows you to quickly select an ISO speed without having to access the menu system, which is very useful in rapidly changing light conditions. Positioned next to the shutter release button is a dedicated button for aperture and exposure compensation adjustment (+/- 2EV), performed in tandem with the command dial that falls under your thumb at the back of the camera. To the right is the Green mode button, which has two uses - firstly, when shooting in Manual mode, a single push of the green button allows you to instantly set the correct exposure for the subject, as calculated by the camera, useful if you need a starting point for your own exposure. Secondly, the K-7 offers a Hyper Program function which instantly switches to either the Shutter-Priority or Aperture-Priority mode from the Program mode, simply by turning either of the control dials on the grip. Pressing the Green button then returns to the Program mode. To the left of the shooting mode dial is a hump that houses the built-in pop up flash, and as expected you also get a hot shoe for additional illumination via an external flashgun, should it be desired. Just behind this, and above the optical viewfinder – which in itself is large and clear – is a large slider for diopter adjustment. The Pentax K-x's optical viewfinder is pleasant enough to use, offering approximately 96% field of view and 0.85x magnification. The 2.7 inch LCD screen offers good visibility even in bright sunlight and the on-screen menus and icons are legible and easy to navigate. To the right of the screen are an array of four vertical buttons, including the familiar playback, info, and menu buttons. The Delete button has been relocated (now shared with the button for manually activating the pop up flash, not a particularly logical move) to accommodate the K-x's Live View mode. This is one of the main differences between this camera and the cheaper K-m model, which doesn't have any form of Live View at all. You can use it to hold the K-x at arm's length or mount the camera on a tripod, with a single press of the new LV button on the rear displaying the current scene on the LCD screen. Focusing is achieved by pressing the small AF button on the rear of the camera or by half-pressing the shutter-button. Live View is fine for use with stationary subjects, but forget it if you want to track a moving subject. The AF system in Live View mode takes several seconds to lock onto the subject, making it much better suited to subjects that don't move. The Face Recognition AF mode works quite well, as promised quickly identifying up to 16 people in the frame, but again it takes a couple of seconds to lock onto a non-moving subject. More impressively Live View can be used in the continuous shooting mode with no restrictions on the 4.7fps rate, as the K-x sets the mirror to the lock-up position. If you grow tired of waiting for the K-x to focus in Live View mode, you can alternatively use manual focus, with up to 10x magnification available via the Info button to help you fine-tune the focus (you can also use the Info button to magnify the subject by up to 6x when Auto Focus is on). Most of the main camera settings are displayed in Live View, including a helpful electronic level that helps to keep your horizons straight, and a small but helpful histogram. You can also change the aperture, shutter speed, exposure compensation, ISO speed and a number of other settings when Live View is activated. 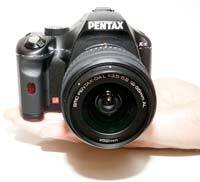 Live View is also used for the feature that will generate a lot of interest in the Pentax K-x: its movie mode. 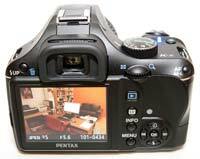 This is the second Pentax DSLR camera to shoot HD quality video, recording high-definition video at 1280 x 720 pixel resolution at 24fps in the Motion JPEG (AVI) format. Video can also be recorded at 640 x 416 pixels at 30fps. The maximum size of a single video clip is either 4 gigabytes or 25 minutes. There's a built-in microphone for mono recording, but sadly no socket for connecting an external stereo microphone or HDMI port for playback on a HD TV, as on the K-7. You can still connect the K-x to a standard TV set via NTSC/PAL though. There are some notable drawbacks to the Pentax K-7's video mode. It's quite difficult to actually start recording one. You have to set the Mode Dial to the Movie mode, then press the AF-On or half-press shutter button to set the focus, then press the shutter button to begin recording (with the same button ending the movie). It's not on a par with the one-button system that some rivals offer, and you can't take a still shot during recording either. As with most other DSLR cameras that offer a video mode, you can't autofocus during movie recording. Focusing manually is the only option, although most AF lenses have MF rings with very little 'travel' between their close-focus point and infinity, and in a quiet environment it's also possible to hear the sound of the focusing ring in the video. In addition you can't set the aperture from the camera during recording, only before, so you will want to use lenses that have an aperture ring if possible. The K-7 can be set to Auto Aperture Control, which removes the flexibility of being able to set the aperture yourself but at least enables the camera to change it during recording to suit the subject matter. The shutter speed cannot be set by the user in movie mode either, so you will have to rely on the camera's auto-exposure system while filming. Handholding the K-7D and shooting video is very difficult, with the DSLR form factor not lending itself well to controlled shooting at arm's length. It's a much better idea to mount the camera on a dedicated video tripod. Casual users hoping to grab some quality footage of the kids may be put off by the inherent difficulties of shooting video using the relatively alien SLR format. The Menu button accesses the logical main menu system. You're given the choice of four horizontal folders. Image record/capture mode and playback settings are displayed next to each other so you can make decisions and adjustments on the fly. The third folder contains the familiar set up options, with the fourth affording access to a wealth of custom settings. A nice touch is that each folder is split into a varying number of pages, with a maximum of 7 options per page so that you never have to scroll down past the bottom of the screen. To the right of the Menu button is a four-way control pad with central OK button – a similar set up to that found on most digital compacts that will be familiar to those trading up. The Pentax K-x's HDR Capture option (only available for JPEGs) takes three images with different exposures, and then records a single image that combines the properly exposed parts of each one, expanding its dynamic range. It's important to always use a tripod to prevent camera shake from blurring the HDR image, and it doesn't work very well for moving subjects. Similar to Nikon's D-lighting, Sony's DRO, and Olympus' Shadow Adjustment Technology, Pentax's D-Range allows you to correct the highlights (On or Off) and/or the shadows (3 different levels) before taking a JPEG or RAW image. Although this option is always at your disposal, remember that it is meant to be used in strong, contrasty lighting at base ISO. The Pentax K-x also has a multi exposure mode that allows you to combine between two and nine different JPEG or RAW images into a single photo and a new Cross Processing mode that replicates the traditional effect of cross-processing film (remember that?!). Pentax's Custom Images, similar to Nikon's Picture Styles and Canon's Picture Controls, are preset combinations of different sharpness, contrast, saturation and colour tone settings. You can change the saturation, hue, high/low key, contrast and sharpness for each of the seven options?. The Pentax K-x additionally offers seven different Digital Filters, which allow you to quickly apply an artistic effect to a photo before taking it (JPEG images only). Note that applying the Digital Filters slows the camera down somewhat, as it has to process the image for a few seconds after it's taken. The K-x can also be set to automatically compensate for both distortion and lateral chromatic aberration of any DA- and DFA-series lenses. Once you have captured a photo, the Pentax K-x has an above average range of options for playing, reviewing and managing your images. You can instantly scroll through the images that you have taken, view 9 thumbnails, zoom in and out up to a magnification of 16x, compare two images side-by-side, and see detailed information about each image by pressing the Info button. You can also delete single or multiple images, view a slideshow, rotate, resize and crop an image, protect images so that they cannot be deleted, and set various printing options, including creating an Index sheet of multiple thumbnails. There are also an expanded range of digital effects available which can be applied to JPEGs - Toy Camera, Monochrome, Retro, Color, High Contrast, Soft, Extract Colour, Star Burst, Fish-eye, Pastel, Slim, Minature, HDR and a Custom mode. The K-x shows you a preview of what the effect will look like when applied, and the effect is applied to a copy of your image, thus preserving the original intact. You can even convert a RAW file into a JPEG in-camera, with 9 different parameters available - impressive functionality for an entry-level DSLR. Importantly the Pentax K-x can display a histogram after taking a photo (just press the Info button) which is a great help in evaluating the exposure, plus any areas that are over-exposed flash on and off in the LCD preview to show you want you should be compensating for with your next attempt (you can turn this on or off). If you have never used a digital camera before, or you're upgrading from a more basic model, reading the comprehensive and easy-to-follow manual before you start is a good idea. Thankfully Pentax have chosen to supply it in printed format, rather than as a PDF on a CD, so you can also carry it with you. In summary the Pentax K-x is an outwardly simple but inwardly very capable digital SLR camera with lots of class-leading features.